GHSP has a unique perspective of what it takes to succeed in the automotive industry. As a Tier One supplier to customers spanning three continents, they have an understanding of various cultures, technical requirements, and products that they have built into their company’s internal culture. GHSP not only provides world-class product design in shift control mechanisms, they also take part in polyvinyl chloride (PVC) reduction initiatives as part of their general directives for all programs. Difficult design obstacles often create challenges when taking this high road. When restyling the Lincoln Navigator’s gear shift, GHSP decided to incorporate a thermoplastic elastomer (TPE) instead of PVC into the design. 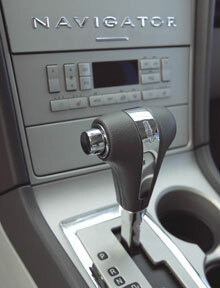 They worked closely with RTP Company to develop a TPE compound specifically for the hand knob of this shifter. There were complex performance requirements that the TPE compound needed to satisfy. It had to fit an existing mold, provide a chemical bond to a PC/ABS substrate, and display the necessary aesthetic qualities so that a leather wrap could adhere smoothly. The challenges were multifaceted. To achieve the desired Class A surface, the material required proper mold-flow with exacting dimensional stability and thickness so that the compound would completely fill in the voids allowing for a surface free of shrink-marks or dimples. Continuous development was necessary to achieve these demanding requirements. The final resulting compound formulated for GHSP was an RTP 1200 Series polyurethane thermoplastic elastomer (TPU) compound. This compound satisfied the required aesthetic and ergonomic qualities, while providing the necessary chemical bond. GHSP was pressured with strict time constraints. “We needed and received quick turnaround on samples,” stated Todd VerHage, Plastics Engineer at GHSP. “We stayed in constant communication with Product Development and Technical Support at RTP and they provided outstanding troubleshooting services during trials,” he said. GHSP is a Tier One designer and manufacturer of mechanical and electro-mechanical assemblies for the automotive industry. For more information, visit their website at www.ghsp.com. EMU Plastics Inc. is a leading plastic injection molding company based in McAllen, Texas. For more information, call 956-618-5200.